First the positives! There's a new stall opened opposite the Golden Fish Bar in GillesPIE Road. 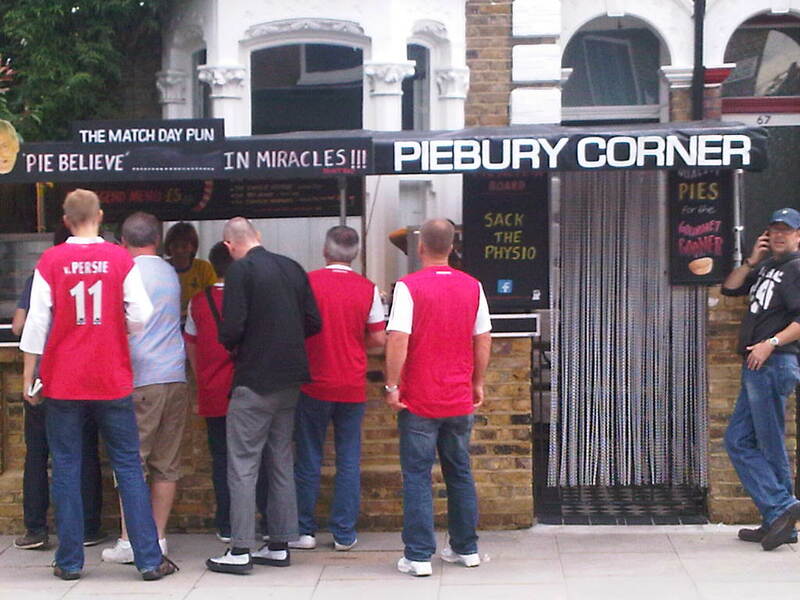 It is punningly called 'Piebury Corner' and sells a range of Arsenal-themed pies. Samples were on offer - I tried the Tony Adams Steak 'a' Ale on the way to the Emirates and the Dennis Bergkamp, which is chicken, on the was back. Both were very tasty with good cuts of meat. At £5 a go they are more expensive than the stadium Chicken Baltis but are, I think, of superior quality. 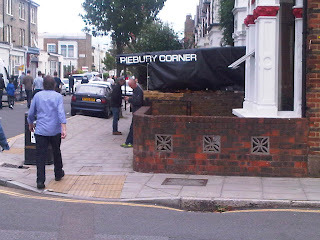 Piebury Corner together with last season's new addition, the stall selling roast pork or beef baguettes further along Gillespie Road, means there is now a choice of superior eating outlets though I did notice the traditional 'cereal' burger bars were still doing a good trade. The match itself was disappointing though a win is a win. The goal was fortuitous but it still required a lot of composure and skill by AA to put it away. Arteta passed the ball well in patches, RvP hit the post with a right-foot shot, Chamakh rose well but couldn't quite direct his header away from the goal keeper. Mertesacker failed to win one ball in the air and could be another Pascal Cygan - not convinced but it's early days. Frimpong was strong - couldn't believe another blog only gave him 4.5. Theo confirmed he's a fast runner but running with the ball is a big problem. He got petulant when not awarded a rather obvious free-kick and followed through with his tackle on the oppo full-back, rightly earning a booking. It's a pity he can't show that level of aggression, albeit in a controlled way, throughout the match. He put in a dreadful cross that disappeared high into the crowd but showed no sign that he was disappointed with his effort. It was almost as if he was saying: "look I can't cross, play me through the middle". For the remainder of the match, he demonstrated his unique ability to hide between two oppo players so he is no position to receive the ball. It did offer the opportunity for me and the chap next to me to engage in a good game of 'where's Theo?' Again the work rate from Theo and AA in particularly was poor though AA's movement when he came inside was good and created some chances. Even Ramsey gave up after driving forward into the box - the ball broke a couple of yards away but by then he had just turned aimlessly away showing no interest in putting their defenders under pressure. So same old same old (whatever that means but it feels appropriate). No desire, no confidence, no commitment - it's gonna be a long season but only 34 games to go! Thanks for your Pie review, your obviously a man with exceedingly good taste who appreciates a pie for detail!